It’s easy to forget, what with all the boozing and melted cheese, but on a skiing holiday you’re at the mercy of a mountain. An actual mountain. And unless you want to wind up like one of those idiots who has to be rescued by helicopter because they decided to saunter halfway up the Matterhorn in flip flops and board shorts, it’s important to dress for the occasion. Snow sports can get wet and cold. Especially if you’re a beginner. The solution: leave the hoodies and flannel shirts to the pros in the terrain park and invest in something equally stylish but also waterproof, functional and durable. When choosing the perfect ski jacket for your time on the mountain, looks are obviously a major factor. The slopes have always been a place for flaunting a little style flair. 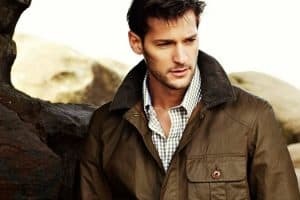 What’s more important, however, is that your chosen outerwear performs well on the task at hand. Here’s what you should be looking out for. Stand a skier and a snowboarder next to one another. You’ll notice some differences in how they’re dressed. Generally, snowboard jackets tend to be loose and long while those designed for skiing are shorter and more fitted. This isn’t just a style thing. When you’re spending full days in the snow you get wet. When you’re charging down mountains repeatedly you get hot. Finding a ski jacket that tackles both of these problems effectively is the key to staying comfortable while riding. In short, you want something that lets moisture out, but not in. Speaking of getting cold, a shell isn’t your only option. Layers are preferable when you’re exerting huge amounts of energy or riding in changeable conditions. However, if you know you’re going to be slashing powder in sub-zero temperatures all day, it’s worth opting for something with a little more protection. An insulated ski jacket will give you this, but at the sacrifice of versatility. Pay attention to the finer details. Things like headphone compatibility and goggle pockets may not be as important as fit and waterproofing but they can certainly make a day on the mountain more enjoyable and comfortable. A powder skirt is a must have for most people too. This will stop snow from getting up your back and down your pants when you’re waist deep in the white stuff. Alternatively, some brands offer their own systems, such as Volcom’s Zip-Tech which allows some pants and jackets to be zipped together, eliminating the need for a powder skirt. It’s also a good idea to make sure your chosen jacket has a strategically placed sleeve pocket to keep your lift pass handy. Whether you’re bombing black runs on your planks, tearing up the halfpipe on your board, or just clumsily sliding down the nursery slope while watching your skis torpedo uncontrollably towards a group of children, these are the best jackets for the job. Originally operating under the decidedly less snappy title of David L. Jacobs Inc., Spyder has spent the last 40 years forging a reputation for itself as one of the leading skiwear labels on the slopes. Known for its high-end, premium apparel, the Colorado-based brand is one of the priciest on the market, but also one of the most forward-thinking and reliable. And that’s before we get into looks, because as well as delivering boundary-pushing tech, Spyder’s jackets are designed to be thoughtfully cut and form flattering. Meaning you can look good even when you stack it half way up a button lift. Founded by British pro skier Jim Adlington, Planks is a true rider-owned ski brand – made by skiers, for skiers. Born out of swanky Val d’Isere in the French Alps, the label was a response to the rise in popularity of freeskiing. For the uninitiated, freeskiers are the guys who drop out of helicopters in the backcountry or jib in the terrain park rather than bombing down black runs with their poles tucked in. This is reflected in Planks’s jackets, which tend to err on the longer, baggier, snowboard-ier side of things for a more relaxed look. Planks offers everything from technical three-layer shells to insulated jackets. You’ll even find T-shirts, hats and more bearing the brand mantra: “Drop cliffs, not bombs”. Gnarly. This premium Canadian performance brand is the Ferrari of the outdoor apparel world. And just like a turbo-charged electric supercar, there’s a lot going on under the hood to justify it. Arc’teryx’s steadfast commitment to innovation and precision engineering has positioned it as an industry leader for the past 30 years. Its dedicated line of ski clothing is testament to this. Here you’ll find some admittedly lofty price tags, but ones that are backed up by intelligent design details such as multiple fabrics for maximum weather resistance and breathability, and watertight zippers to keep that precious lift pass bone dry. You know that bit in The Dark Knight Rises where Bane does his bit about being born into darkness and moulded by it? Well, Norwegian outerwear brand Helly Hansen could pretty much say the exact same thing about snow. The label has been kitting out everyone from mountaineers to Arctic trawlermen since the 1800s and skiers and snowboarders are no exception. Specialising in hard-wearing technical apparel, capable of standing up to a hammering, Helly Hansen is a firm favourite among seasoned pow addicts and casual riders alike. If you’re going to jet off on one of the most boujee types of holiday there is, you might as well go the whole hog and drape yourself in some luxurious Italian outerwear. While there are a number of brands that can cater for you in this department, Colmar is one of the more exclusive. Meaning you’re more likely to elicit cries of “Ooh I love your jacket, where’s it from?” in the apres bar, than “Oh, we’re both wearing the same coat. One of us is going to have to change”. Despite being relatively under the radar outside of ski circles, Colmar has been on the scene since 1923. And with a range of simple, pared-back pieces alongside bold, striking designs, there’s a ski jacket from this luxury label to suit every taste. Japan is legendary among snow sports aficionados. Not least for the sheer volume and quality of snow that covers the peaks of Hokkaido each and every winter. It’s even earned it the nickname ‘Japow’ among those who make the annual pilgrimage there to get up to their necks in the good stuff. This considered, it shouldn’t come as a surprise that one of the best skiwear brands hails from Nippon. Descente is highly regarded among skiers and has kitted out many an olympian over its 50-plus years on the slopes. Known for its industry-leading technology – think in-jacket heating systems and beyond – the label is the go-to for high-performance, teched-out ski jackets. When it comes to luxury outerwear there are few labels that pack a bigger punch than Moncler. Born in the Alps, the Italian label has its roots in mountain culture and produces a suitably lavish line of premium skiwear to prove it. Named after the French mountain city, Grenoble is Moncler’s specialist ski range, boasting pieces that would look just as at home on a Fashion Week runway as they do on the pistes. Granted, these are jackets that’ll leave even the flushest of wallets considerably lighter but if it’s style and status you seek then you’d struggle to do better. Considering snowboarding only came into existence in 1965 and didn’t really take off until several years later, Burton’s birth year of 1977 puts it up there as the oldest dedicated brand on the scene. As you might expect of a snowboard label that has been big in the game since day dot, Burton produces some of the best and most reliable apparel to be found. These jackets are well built, stylish enough to rock on or off the mountain and come with a snowboarding pedigree that no other brand can match. When the guys who founded the brand are called Wooly and T-Dawg, you can rest assured you’re in good hands. These guys live, eat, sleep and breathe boardsports – something reflected in the thoughtful finer details of Volcom’s products. The Californian label is well known for its outerwear among snowboarders and favoured for features such as Zip-Tech technology which allows the hem of a jacket to be connected to the waist of a pair of trousers. In other words, no friends on a powder day, but also no more soggy boxer shorts. When selecting a jacket for slashing powder and bombing down groomers you could do a lot worse than go with one of the biggest boardsports companies on the face of the planet. Whether you’re tube riding in Hawaii, skating bowls in SoCal or shredding in the Rockies, Quiksilver has go the right stuff to kit you out. After breaking onto the scene in 2013, Adidas was a relative latecomer to the snowboard party. However, with some of the best-looking gear on the slopes and some of its most popular shoes reimagined in snowboard boot form, it’s more than compensated for its initial absence. If you’re looking for low-key, stealthy style, Adidas may not be your best option. If, on the other hand, you’re more interested in making a fashion statement in the terrain park then an oversized, retro-inspired jacket from The Brand With The Three Stripes will get the job done every single time. For those of us not involved in action sports it’s difficult to hear the word “Oakley” without immediately picturing a middle-aged man in a pair of regrettable wrap-around sunglasses. However, in the world of boards, dirt bikes and beyond, the American brand is worshipped for its premium goggles and high-quality outerwear. Oakley’s knack for making great gear has earned it some of the biggest and best names in the game as team riders. Olympic medalists like Ståle Sandbech, Jamie Anderson and Sebastien Toutant all fly the flag for Oakley’s jackets. And if it’s good enough for them, it’s more than good enough for the likes of us. There are precious few companies that can claim the same commitment to ecology and ethics as Picture. The brand only uses factories that have signed a contract ensuring the best practice and working conditions for their staff and uses a high percentage of recycled fibres in its clothes. But that’s not all, Picture is one of the few sustainable brands excels in the style stakes, too. If bright colours and quirky styling are your thing then there’s no brand better suited to your needs. Couple this with high build quality and ergonomic designs and you’re onto a surefire winner. You know it as the brand that provided you and all your mates with giant puffy skate shoes in the early 2000s. However, if you thought that’s where DC’s output ended you’d be sorely mistaken. The Quiksilver-owned brand is one of the leading names in snowboarding, making top-of-the-line boards and all the garb you need to hurtle down mountains on them. That includes some of the coolest jackets going. Think baggy cuts, stylish designs and all the latest features, from technical fabrics to music player integration.